The weekend takes place from 24-26 March (Friday night until Sunday afternoon) at Peat Rigg Outdoor Centre near Pickering. The package includes a huge range of activities for members aged 13-17 years, giving them a great opportunity to test how adventurous they are and mix with other young members from all across the county. 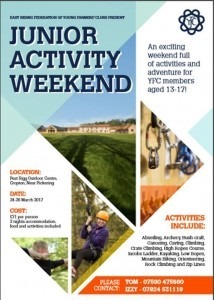 Half the cost of the weekend has kindly been subsidised by the County Federation, meaning the entire weekend including all meals and activities only costs £71 per person! Any questions, please feel free to contact Tom Screeton or Izzy Moulds numbers below.